Derek Weinkauf knows no strangers – or doesn’t for long. 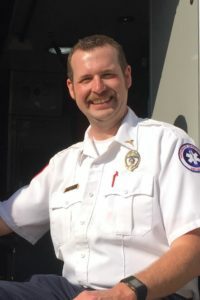 During his four-plus years at EMSA, Derek has earned a reputation as always having a smile on his face, the team’s mission on his mind, and his patients’ best interests at heart. He has received numerous kudos during his career for providing excellent care on critical calls and demonstrating incredible compassion when interacting with suicidal subjects and patients’ family members. Derek shows consideration and respect to everyone he meets. Derek is an accomplished Field Training Officer. His approach to teaching new recruits is simple yet effective: don’t expect perfection, but rather strive for excellence. Derek was inspired to become a public servant by his grandfather, who was a long-time member of the Tulsa Fire Department.